I wanted to try something new , so this wall is unusual from my other walls. I vectored this scan , therefore it's was quiet hard to make a suitable background for it . Thanks to `Chloe-chan and ~Hibari-Kyoya for the texts in the background , i asked them to give me some sentences by this character since i haven't seen this anime yet.That's it and Hope you like it! This is so cool! fav. Like i said in AP well done. i love the hair a lot! 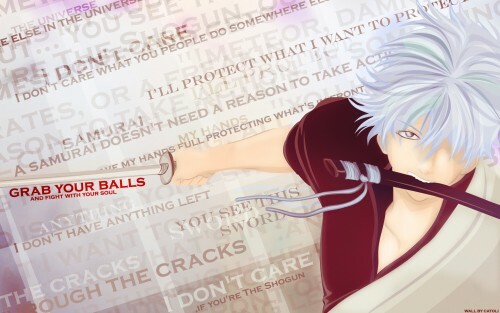 Lmao, the title really suits Gintoki. ginpatsu, gin iro no tamashii! Love the text in the background. It's wonderful! I am a fan of quotes, so I absolutely love this! gintama has the coolest titles ever!